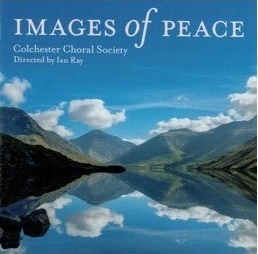 Colchester Choral Society has just released a CD of Alan Bullard's Image of Peace and other unaccompanied English choral works. This CD is available for purchase for £10 (plus p&p). To place an order and to find more about Images of Peace and the CD please visit Alan Bullard's website here or click the image below. 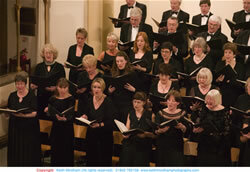 Colchester Choral Society works to uphold and strengthen the English Choral tradition by performing a variety of public concerts of the traditional large scale oratorios as well as exploring more intimate repertoire including regularly singing a cappella. 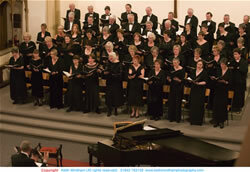 Under the directorship of Ian Ray since 1976, Colchester Choral Society has achieved enthusiastic recognition in the region for presenting concerts of the highest standard, successfully performing some very demanding works and regularly involving soloists of national and international distinction. Whilst not neglecting the more well known choral repertory, the society brings audiences some of the less frequently performed choral music from the baroque period to the twentieth century. The society was founded after the Second World War by Dr WH Swinburne, OBE, whose formidable commitment and enthusiam set the standard that established the society's reputation during the first 30 years. These same qualities of enthusiasm, commitment and an aspiration to attain the highest standard possible under inspiring direction, make it possible for the choir to perform an extremely widely varied repertoire ranging from Beethoven and Handel through to Elton John and Karl Jenkins. 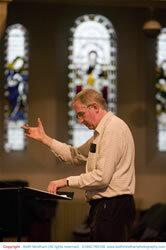 The choir is directed by Ian Ray, the recently retired Head of Vocal Studies at Colchester Institute. We perform 4 concerts every year covering a wide range of traditional and more modern pieces. An after concert reception is held for the choir and audience following all the main concerts. New singing members of the society are always welcome. For more details see our Membership page. Members work together as a team to present as professional production as possible and also enjoy social and fundraising activities. Various non musical talents and expertise of members and friends contribute to the administration and success of the society. Non-singers may become Friends of the Society, who support the Society financially and in other ways. Becoming a Friend of the society gives reduced entry tickets to all Society concerts, wine tickets for the after concert refreshments, copies of the newsletter, plus invitations to the social functions that run throughout the year. They are invited to attend the Annual General Meeting. We are looking for keen singers in any part - particularly tenors. If you have any tenor friends let them know!